Relay For Life has partnered with Virtuart Gallery to create an art auction to raise money for the American Cancer Society. There will be ten artists featured in this auction, creating one off art works that capture the theme of the event, “A Journey of Promise.” A gallery has been built to display the works, it’s a place that has been made with a lot of thought and a lot of care, an artwork within itself. I am truly honoured to have been asked to be one of the artists to take part. I will have the pleasure of having my works on display beside a group of amazing artists. The auction will start on Friday the 25th and end on Sunday the 27th of April. The sim itself will be open at 12pm SLT on Friday the 25th. 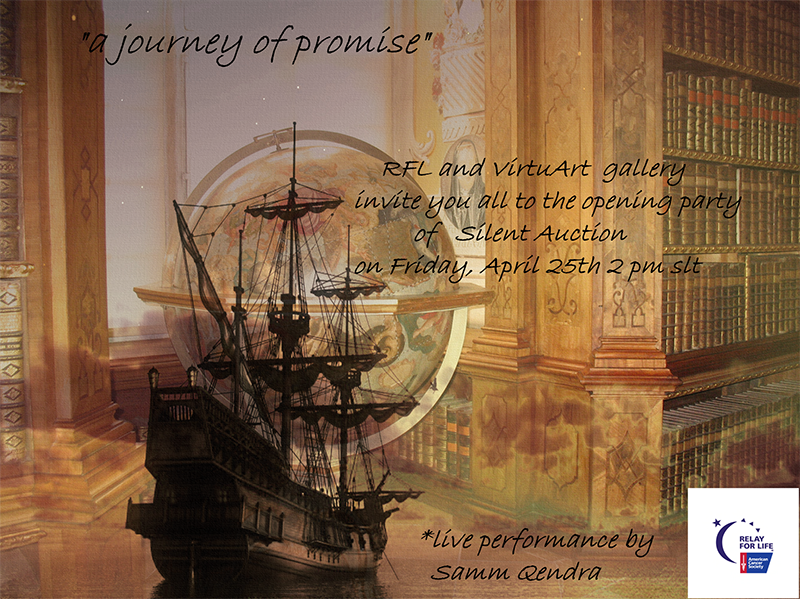 At 2pm SLT on Friday the 25th there will be a performance by Samm Qendra to celebrate the start of the auction. On the 27th at 11am SLT there will be a performance by Maximillion Kleene, followed by a performance by Keeba Tammas and theTiny Maniacs at 3pm. You are all invited to attend the auction as well as the celebrations, I hope very much that you can make it!